BHOPAL: Hon'ble Chief Minister of Madhya Pradesh Shri Shivraj Singh Chouhan felicitated Sudhir Mishra, Distinguished Scientist and Chief Controller DRDO, also CEO & MD of BrahMos Aerospace with "Madhya Pradesh Gaurav Samman" at a glittering ceremony held on 01 November on the occasion of Madhya Pradesh Day at Lal Parade Ground, Bhopal. 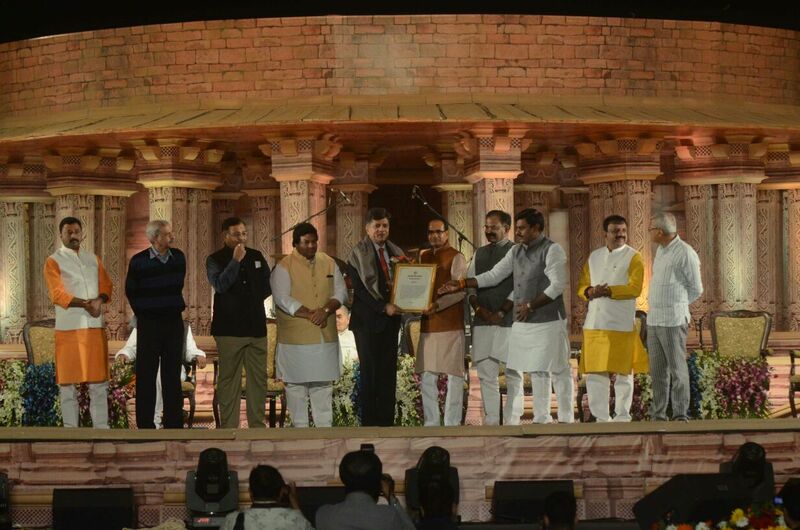 "Gaurav Samman" is a prestigious Award of Government of Madhya Pradesh which is conferred to individual hailing from Madhya Pradesh and have performed exceptionally well in brightening the name of the State at global level. Shri Mishra who was born in Jabalpur, Madhya Pradesh has done his Engineering Graduation from Jabalpur Engineering College followed by higher education at IIT Madras and NIT Warangal and has contributed outstandingly in the field of Missile Technology and is currently the Chief of the World's fastest Supersonic Cruise Missile Project, BrahMos. His outstanding contributions have resulted in the realisation of many advanced capabilities in the Weapon System including top attack capability for the mountainous warfare operations, realisation of airborne launcher and its integration with Su-30 MKI aircraft, establishment of many state-of-the-art Technical Positions, deployment in various arms of Indian Armed Forces and numerous CSR activities carried out across the India including Madhya Pradesh.